Expand the links below to see more information on Seal Science’s most widely used elastomers. Each of these materials has its own unique place within the sealing industry and each has benefits or downfalls depending on the application. If you are unsure which material would be best for your specific application, contact us and we will be able to point you in the right direction. Click here for a detailed table with Chemical Compatibility Information. Note: These are common elastomer materials. For a different compound that is not listed, contact us directly. Butyl, an all-petroleum product, is a copolymer of isobutylene and isoprene with excellent resistance to ozone and sunlight aging (due to the presence of the saturated isobutylene in the polymer chain). Butyl offers resistance to hot water and steam up to 250°F and has outstanding low permeability to gases that makes it ideal for vacuum seals. Only slightly affected by oxygenated solvents and other polar liquids ( e.g. alcohols, ketones, and esters), Butyl was often used in hydraulic sealing applications using synthetic fluids, but has largely been replaced by Ethylene Propylene since its introduction. Because it is a petroleum product, Butyl has poor resistance to hydrocarbon solvents and oils, and diester-based lubricants. Ethylene Propylene is a copolymer of ethylene and propylene (EPM), and sometimes a terpolymer due to the addition of a diene monomer (EPDM). Ethylene Propylene is excellent for sealing applications involving phosphate-ester hydraulic fluids or glycol based brake fluid systems. EPDM also features a good resistance to polar solvents (ketones, alcohols, esters) and is highly effective for use with steam up to 400°F. Ethylene Propylene is also chosen for outdoor applications because of its resistance to aging when exposed to either ozone or sunlight. Ethylene Propylene performs poorly when exposed to petroleum oils, diester-based lubricants, or aromatic fuels. And although EPDM is resistant to polar solvents, it is not recommended for its overall solvent resistance. Fluorocarbon compounds, also referred to as fluoroelastomers, are thermoset elastomers that contain fluorine. Fluorocarbon has excellent resistance to high temperature, oxygen, ozone, synthetic hydraulic fluids, mineral oil, fuels, aromatics and many organic solvents and chemicals. High fluorine grades can offer higher resistance to swell in high octane and oxygenated fuel blends. This give superior performance in Ethanol/Methanol blended gasoline. Base resistant grades offer improved resistance to amine based oil protectants found in new transmission oils. Sealing applications with high temperature and low compression set requirements make Fluorocarbon an ideal material choice; often found in aircraft engines and automotive fuel systems. Low temperate resistance for static applications is limited to approximately -15°F. Certain compounds are suitable down to -50°F in these situations. Under dynamic conditions, the lowest recommended service temperature is between 5°F and 0°F. Fluorocarbons are not recommended for environments with ketones, amines, low molecular weight organic acids (formic and acetic acids), hot hydrofluoric or chlorosulfonic acids, nitro hydrocarbons, glycol based brake fluids, or superheated steam. Fluorosilicone is the common name for fluorovinylmethyl silicone rubber. Generally specified for aerospace use, Fluorosilicone is becoming an increasingly popular material for other applications due to its excellent fuel resistance and high temperature stability. FVMQ has similar mechanical and physical properties to VMQ (silicone), but has improved fuel mineral oil resistance in lieu of VMQ’s superior hot air resistance. Fluorosilicone features good compression set and resilience properties that make it suitable for exposure to air, sunlight, ozone, chlorinated and aromatic hydrocarbons. High friction tendencies, poor abrasion resistance, and limited strength make Fluorosilicone a poor choice for dynamic uses. They are also not recommended for environments that will expose the material to brake fluids, hydrazine, or ketones. Chlorosulfonated polyethylene (CSM), best known as Hypalon®, offers resistance to corrosives, heat, oil, oxygen, ozone, and weather. Higher chlorine levels lead to an improved oil resistance at the expense of heat resistance and low temperature flexibility. Vice-versa, you can achieve higher heat resistance and low temperature flex with lower levels of chlorine. In general, CSM is highly resistant to degradation by corrosive chemicals and is very resistant to oxidation. CSM compounds also resist fire and are self extinguishing. CSM is limited more by swelling than degradation with solvents, but are not recommended for environments with aldehydes, esters, ethers, ketones, aromatic, chlorinated or nitro hydrocarbons. Natural rubber, also known as polyisoprene, is the vulcanized product from the latex of the Hevea brasiliensis tree. Before the development of synthetic rubbers in the 1930s, Natural rubber was the sole O-ring polymer. The Medical industry has since moved away from Natural Rubber because of its allergic reactions after repeated contact. Natural rubber exhibits low heat build up, high resilience and elongation, good abrasion resistance, excellent low temperature flexibility, good friction surface, and is excellent for adhesion to metals. Natural rubber also has good resistance to organic acids and alcohols, with moderate resistance to aldehydes. Due to its tendency to strain crystallize (a process which turns the amorphous rubber into a semi-crystalline material when stretched), Natural Rubber also has high tensile and tear strength. Natural rubber should not be used with any oils or solvents. It also does not have much resistance to ozone, oxygen, or UV light. Natural Rubber also has a poor compression set performance at elevated temperatures. Neoprene, also called polychloroprene or chloroprene rubber, is a synthetic rubber produced by the polymerization of chloroprene. Polychloroprene, one of the first successful synthetic rubbers developed, was first prepared by DuPont and marketed as Neoprene. The trademarked name has since become generic and was originally invented as an oil-resistant substitute for natural rubber. Neoprene can be used in many sealing applications over a wide range of temperatures due to its desirable mechanical properties: good resistance to petroleum oils; good resistance to ozone, sunlight and oxygen aging; relatively low compression set; good resilience; outstanding physical toughness; and reasonable production cost. Due to its excellent resistance to Freon® and ammonia, Neoprene is also widely accepted as a preferred material for refrigeration seals. Neoprene is not compatible with strong oxidizing acids, esters, ketones, chlorinated, aromatic, or nitro hydrocarbons. It is good to note that Nitrile has largely replaced Neoprene in the O-ring industry because it is comparable in pricing and has superior performance in most situations. Nitrile is currently the most widely used and economical elastomer in the seal industry. Nitrile (NBR) is the general term for acrylonitrile butadiene copolymer. The acrylonitrile content of the compound can very considerable (20% to 50%) and influences the finished material’s physical properties. The compound’s resistance to oil and fuel increases with the content of acrylonitrile while adversely affecting the elasticity and resistance to compression set. These properties must be properly balanced with the acrylonitrile content to ensure the proper Nitrile compound is selected for the sealing application. Nitrile has good mechanical properties and high wear resistance that make it useful with petroleum-based oils and fuels, silicone greases, hydraulic fluids, water and alcohols. Nitrile compounds are attached by small amounts of ozone and therefore it is not resistant to weathering and ozone. Phthalate type plasticizers are also commonly used in Nitrile rubber. These plasticizers can migrate out and cause problems with certain plastics. New regulations on certain phthalates have also limited their uses. The butadiene segment of Nitrile compounds imparts the elasticity and low temperature flexibility, but it also contains an unsaturated double bond that is susceptible to heat, chemicals, and oxidation. Perfluoroelastomer (FFKM) has the highest temperature range and the most comprehensive chemical resistivity of any rubber material. Most commercial perfluoroelastomers are terpolymers of TFE, PMVE, and CSM. Like fluorocarbon elastomers, the bonds between carbon and fluorine atoms make the chemical structure of FFKM extremely strong; leading to long service life in virtually all chemicals. It should be noted that due to its high cost perfluoroelastomers are generally only used when no other elastomer is acceptable. Although perfluoroelastomers have excellent resistance to almost all chemicals, FFKM can swell significantly when exposed to some fluorinated solvents or fully halogenated freons. FFKM seals should not be used in an application where it would be exposed to molten or gaseous alkali metals. Polyacrylate is a copolymer with outstanding resistance to petroleum fuels and oils. Polyacrylate O-rings are often used by the auto industry for transmissions and power steering systems because of its excellent resistance to hot oil. Although it is marginally more resistant to hot air than Nitrile, Polyacrylate is not up to par when compared to the compression set, water, or low temperature resistance of many other polymers. Polyacrylate does, however, have high resistance to sunlight and ozone degradation while maintaining an enhanced ability to resist flex cracking. Polyacrylate is not recommended for environments that contain alcohol, glycols, alkalis, brake fluids, or to chlorinated or aromatic hydrocarbons. Polyurethane elastomers have excellent wear resistance, high tensile strength, and high elasticity when compared to other elastomers. This material offers superior seal performance in hydraulic applications with high pressures, shock loads, or abrasive contamination is anticipated. These properties make polyurethane one of the toughest, most extrusion-resistant, and most abrasion-resistant elastomer in the sealing industry. Possessing chemical compatibility similar to Nitrile, Polyurethane has good resistance to hydrocarbon fuels, petroleum-based oils and hydraulic fluids. At higher temperatures, Polyurethane loses its physical strength and chemical resistance due to its softening. It is also not recommended to expose Polyurethane to concentrated acids, ketones, esters, chlorinated or nitro hydrocarbons. Silicone is made up from a strong sequence of silicon and oxygen atoms. Much stronger than a carbon based structure, the silicon-oxygen sequence makes silicone more resistant to extreme temperatures, chemicals, and shearing stress. Because of this, Silicone is an excellent choice for static seals in extreme temperature environments. Silicone is also highly resistant to the aging effects of sunlight and ozone. It is also used in many medical devices due to the fact that Silicone is fungus resistant, odorless, tasteless, and non-toxic. Poor tensile and tear strength with a combination of low abrasion resistance and high friction characteristics deter Silicone from being used in most dynamic sealing applications. Silicones are also highly permeable to gases and are generally not recommended for environments that would expose the seal to ketones, concentrated acids, or steam. NOTICE: The information on this page is to be used a professional guide only. The information and data contained within this page is to the best of Seal Science’s knowledge true and accurate. 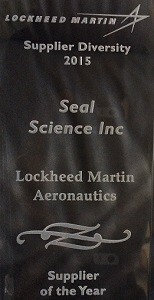 As specific application use is beyond the control of Seal Science, and all engineering guidance and recommendations are presented without guarantee or responsibility on Seal Science’s parts and users should conduct their own tests to determine the suitability of the products in any specific situation or application. These recommendations are general and should not be relied upon by any person without independent verification based on the particular installation or use. Before installation, we strongly recommend that you rigorously test the material and actual application prior to production use.